Accurate diagnosis of Parkinson’s disease, and the related disease “dementia with Lewy bodies,” can be difficult in the early stages of both conditions. While brain biopsies can be more accurate, the risk of complications has been considered too high. New research published in the Journal of Parkinson’s Disease indicates that a biopsy of the submandibular gland can help identify the same pathology that is seen in the brain, providing some of the increased accuracy of brain biopsy, but not the increased risk. Investigators had previously shown, first in autopsies and then with biopsies, that the submandibular gland, the saliva-producing gland in the neck, has the signature alpha-synuclein microscopic pathology of Parkinson's disease and that the gland can be biopsied to provide an unambiguous confirmation of diagnosis. “This new work shows, in autopsies, that the submandibular gland also has the same signature alpha-synuclein pathology in a high proportion of subjects diagnosed during life with dementia with Lewy bodies. Biopsy of the submandibular gland then also may be able to provide a more accurate diagnosis of dementia with Lewy bodies during life,” explained lead investigator Thomas G. Beach, MD, PhD, Head and Senior Scientist at the Civin Laboratory for Neuropathology, Director of the Brain and Body Donation Program, Banner Sun Health Research Institute (BSHRI), Phoenix, Arizona. Lewy-type α-synucleinopathy (LTS) is found in the brains of all Parkinson’s disease patients when they are autopsied. For a number of other diseases related to Lewy bodies, this same pathology is present. This study involved subjects with central-nervous-system Lewy-type diseases and a control group without Lewy-type pathology. Both groups were comprised of elderly subjects who had volunteered for the Arizona Study of Aging and Neurodegenerative Disorders and the Brain and Body Donation Program (BBDP). When LTS is present, it is possible to see it by using an immunohistochemical staining technique. 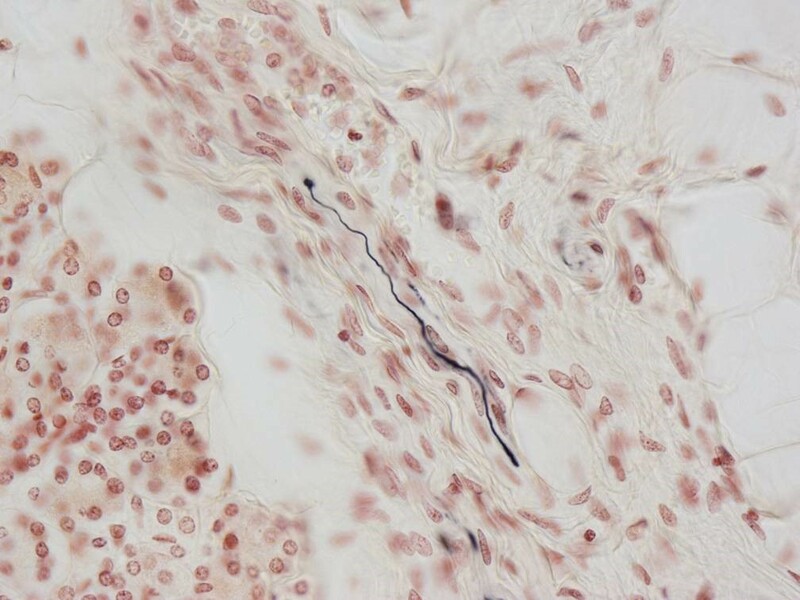 In the image, the dark line is a nerve fiber in the submandibular gland, made visible with the stain. This finding was not observed in normal control subjects. In this study, submandibular gland alpha-synuclein pathology was found in 42/47 (89%) of autopsies of individuals with Parkinson's disease and 20/28 (71%) of those with dementia with Lewy bodies, but in none of the 110 control subjects. Caption: The black fiber is positive for alpha-synuclein pathology inside a nerve fiber in the submandibular gland. The subjects had a variety of conditions. Those with Lewy body disorders included 46 with Parkinson’s disease, 28 with dementia with Lewy bodies (DLB), nine with incidental Lewy-body disease, 33 with Alzheimer’s disease with Lewy bodies, and two with progressive supranuclear palsy with Lewy bodies (PSPLB). Control subjects, defined as individuals without central-nervous-system LTS, included 79 normal elderly subjects, 15 with Alzheimer’s disease, 12 with progressive supranuclear palsy, two with corticobasal degeneration and two with multiple system atrophy (MSA). “Prevalence of Submandibular Gland Synucleinopathy in Parkinson’s Disease, Dementia with Lewy Bodies and Other Lewy Body Disorders,” by Thomas G. Beach, Charles H. Adler, Geidy Serrano, Lucia I. Sue, D.G. Walker, Brittany N. Dugger, Holly A. Shill, Erika Driver-Dunckley, John N. Caviness, Anthony Intorcia, Jessica Filon, Sarah Scott, Angelica Garcia, Brittany Hoffman, Christine M. Belden, Kathryn J. Davis, Marwan N. Sabbagh, and the Arizona Parkinson’s Disease Consortium (DOI: 10.3233/JPD-150680). It is published in the Journal of Parkinson’s Disease, Volume 6, Issue 1 by IOS Press. To obtain the full text of this study and additional information contact Daphne Watrin, IOS Press, at +31 20 688 3355, d.watrin@iospress.nl. Journalists wishing to interview the authors should contact Thomas G. Beach at Thomas.beach@bannerhealth.com or Charles H. Adler at cadler@mayo.edu.